For many women, getting back in shape is difficult after having a child; and with the kids out of school for the summer, it can seem even more challenging. Throw in owning a business, running carpool, juggling summer camps and what is a mom to do? Does that mean you’ll be unable to find that strong, “hot mama” body again? Heck no! It just means that you will have to use some creative strategies to rediscover your fitness levels. 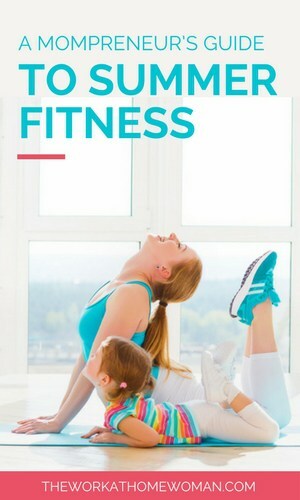 Learn how to exercise with your little ones and implement fitness into your daily lives, and you’ll quickly discover that you have more energy, not less. And the more energy you have, the quicker you can run after your kids when they are getting into your computer, opening your makeup drawer, or are climbing on the counters. Walking is one of the best forms of exercise, and being outside makes everyone happier. If you have babies, push them in a stroller. With bigger kids, have them ride scooters or bikes. You will enjoy engaging your muscles and using them, while your babes will appreciate the sites and sounds of being outside. Let your bigger kids know they’re your “coach” and are there to motivate you. It helps kids feel empowered, and their pace may speed you up. Schedule a walk date/appointment with another Mompreneur 2-3x/week at a different park. When walking, discuss your next business plans and brainstorm. While doing so, make sure to keep the pace fast and posture perfect. Keep your shoulders rolled back, hips tucked under, abs engaged and forearms nice and relaxed. Try to keep your stride at 3.5-4.5 miles per hour. Use the stop signs or other landmarks and encourage one another to speed up between the landmarks. When you’re at the park, play like a kid. Be a mama who runs after her children and climbs on the play structure. Try to do some step ups on the stairs and push-ups on the park benches. Use the swings as a way to truly engage your abs and lean back when swinging, flexing and contracting your abs. Challenge your bigger kids to monkey bar contests and see who can go farther without falling. Do some pull-ups on the bars (or attempt to) and hold your up position on the bar for as long as you can. Challenge your kids to do the same. Try a relay race with the kids. Put toys/cones on either side of the park that you have to tag. Run from side to side, increasing your pace with each crossing. Mix up the way you do the crossing—try a side step and a skip in addition to straight-ahead running. Try to do each skill four times. Repeat for 3 minutes and add 10-15 push-ups at each cone. Play Freeze Dance with the Crab Walk. Attempt to have all your kids do the crab walk for 15 seconds and when you say “Freeze!” everyone has to stay steady and do ten mini-dips. This is a game that helps clean the house, but also tones your body. After your little ones have played with toys, put on the timer and play a game of Clean Up. Everyone has to sprint between the toys. The challenge is to clean up each toy; you have to get into proper squat position, hold it for 10 seconds, then pick up the toy and toss it in the toy box. Repeat until your floor is spotless. Then dump the toys and see if you can beat your previous clean up time. Repeat until wiped out. Stand with your legs shoulder-width apart and knees relaxed. Feel as if you are sitting down in a chair. Contract your abs and bring your belly button towards your spine, keep your shoulders rolled back and in proper posture. Make sure to keep your knees back, not bringing them over your toes and keep your weight in your heels. Gradually sit down, hold for 3 seconds, and bring yourself back up to starting position. Movie time is ab time. Start out kneeling with hands on the floor. Gently lower yourself to your forearms. Slowly extend your legs out straight behind you. Focus on pulling your abs towards your spine and squeezing your gluteals and inner thighs. Relax your gaze keeping your spine in alignment. Your body should be flat like a slide. Hold for 15 seconds and rotate to your right side raising your left arm to a 90-degree angle and arm above the head. Lower and raise right hip towards ground 5x. Return to plank position, hold for 10 seconds, repeat on left side. Do 3-5 total rotations. Lie on your back with your knees out to the side and feet touching each other like frog legs. With hands behind your neck, bring knees to elbows and elbows to knees like a clam. Repeat 15 times. Juggling mamahood, owning a business, and life, in general, doesn’t have to mark the end of fitness. By incorporating just a few of these strategies, you can turn family time into exercise time. Rock your workouts, and your days will feel more balanced and rocking too! Erin Shirey: When not chasing after her two little girls or teaching fitness classes, Erin Kreitz Shirey is motivating and training others to become their fittest selves yet as the Coach/CEO/Master Trainer Power Fitness PDX. She has written for many athletic publications has been a contributing editor on the hit morning show “Better,” and her business was recently voted Best of The Bay Top 5 Boot Camps. Erin has a BS in Kinesiology, is an ACE Certified Personal Trainer, Stott Pilates, Sports Nutrition and Fit to Deliver Pre and Postnatal, Certified Trainer. She can be found encouraging athletes of all ages and shapes at, Power Fitness PDX and Power of You Fitness Blog. Email Erin.